I did take some construction photos of the fish van and can post if anyone is interested. Really enjoying this thread, I never thought I'd see the Fish van modelled in 'N' and then you find the BH kits. But the GN clerestory fruit van is superb, I've always had a soft spot for these after seeing one in Peter Tatlow's book but never thought I'd see one in 3d in whatever scale. Excellent work. Are you likely to release this for sale at some point? Some cracking variations atso! !!! Could you not 3d print some end panels with vertical planking to replace existing ones?? If you don’t mind me asking what length of rake will it be and what is going to pull it. It's a shame that Ray is out of the fish vans at the moment, otherwise I'd have had a few more over the fruit vans. I'm quite happy with the GN clerestory van too! It needs a few tweaks still to fit peco wagon chassis properly and to make painting a little easier but I think that I might have a go a resin casting a batch at a later date. I could 3D print some end panels but the idea with the peco vans (and BHE etches) was to have a go with so methods I wouldn't usually employ. That being said, I have some of the old Parkwood LNER van kits which came with a range of ends (to create several variants) so I might have a go at splicing some of those in. At the moment the wagons are without couplings. However for the fixed rakes, I'm think of using a simple hook and eye arrangement made out of wire and araldited onto the bottom of the chassis. This was covered in the N'spirations magazines by (I think) Noel Leaver and from the pictures in the article, looks pretty unobtrusive. I didn't know I had the skills until I had a go! 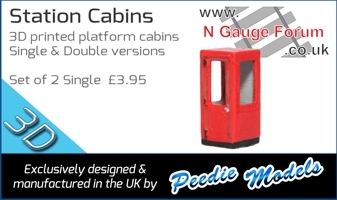 To be honest the Peco vans will be (to borrow a phrase from Tony Wright of BRM/RMWeb fame) 'layout wagons' and will be filler pieces on my 1930's ECML layout. I'm modelling a relatively small station borrowing ideas/features from Hertford East, Palmers Green (both on the Hertford Loop and not actually part of the ECML) and Hitchin. Therefore many of the fitted trains would be through workings and, as I'll have the ability to run c. 30 trains, quite a few wagons and coaches will be required. My maximum length would be 9 Gresley coaches or c. 27-30 wagons (which would be too long for the station and it's limited goods facilities) - the exception being a special loop to hold a representation of the New England - London coal train which will be 40+ wagons (still only half the actual length of the prototype). With regard to motive power, it could be almost anything I own or am building. J3, J6, J11, J39, J50, J52, K2, K3, N2, V2 are classes either owned/built or in the process of being designed/built and would represent typical classes working goods trains (my J50 would be ruled out of pulling fitted train as my model is an unfitted example). The J50 and J39 weren't common classes to the London area in the 1930s but were seen. I've got a Farish J39 (which won't be converted into a J6) because I quite like it and two Union Mills versions which will eventually end up being detailed and provided with representations of the small style of LNER tenders that was more common to the class. At the moment, I've very light on unfitted wagons (i.e. non-vacuumed braked) and general open wagons, both of which were still very common in the period I'm modelling; this will need to be addressed in time. It isn't always appreciated that the LNER was pretty much always short of cash and therefore pre-grouping designs often lasted much longer than was the case on the other railways. For example it is estimated that in the late 1930s only c.30% of the LNER's passenger stock in service had actually been build post the 1923 grouping - this is what I'd like to represent in my own modelling, the cutting edge (for the 30s) running alongside the ancient! That is a big improvement - any chance of some photos of the work done underneath? I wouldn't mind having a go myself on this one. Did these wagons make it into BR days do you know? I don't know about the NER bogie van but the sulphate wagons survived at least into the 1960s. However most of the fleet were apparently used to transport London rubbish out of Enfield from around 1961/2. Edit: Forgot to mention that mine need a repaint as they are actually in a form of BR livery! How did the buffer heights compared to other stock compare after the modification?